The Internet of Things (IoT): useful, but can be a bit of a hassle to install. Netshield brings a whole new dimension to getting things done with its WIFI IOT Multi Sensor IO modules. Is power and cost an issue? Do you need to monitor the environmental elements of your business via the Cloud? Sorted. 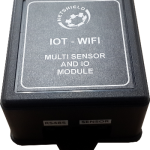 The WIFI IOT Multi Sensor and IO modules have their own battery so there is no need for a power source or a wired connection. This means that they are ideal for remote installations. Because it has its own built in Wi-Fi interface, sensors can be strung onto the device so that data can be sent back from the sensors to where you are – all via Wi-Fi. Speaking of remote: Devices can be remotely configured, and once installed, anyone can switch them on, significantly reducing the initial cost of deployment. And the benefits of having data sent viaWiFi are endless. Not only is it quick and easy to install, and easy on the pocket, but it is exceptionally useful in places where a trench would need to be dug or infrastructure rebuilt in order to deploy IoT. They are easy to install, quick to deploy and come at a cost point that make them exceptionally attractive to businesses of all sizes. The modules that Netshield have developed were created with cost effectiveness in mind and were built from the ground up. The devices connect sensors to the Cloud quickly and with minimal expense, and enable them to better monitor temperature, humidity, water leaks and a host of other environmental factors of their business. What’s more, the devices can switch to multiple output contacts, which can be used for applications such as opening doors and switching lights and systems in the environment on or off. Still, their primary aim is to assist with monitoring and controlling the environment. And the sensors can connect to more than one device. Customers wanting to expand the footprint of what they monitor can connect to multiple RS485 sensor hubs and can then view each device via a smartphone, tablet or Web browser. Each module comes in a small enclosure with mounting gears that can be strung into the IoT devices in a customer’s environment with CAT 5 or patch leads, and then communicate information back via Wi-Fi. Because they are light weight and have a user friendly form, they be attached to a surface with double-sided tape. IoT is being used more and more, and people are seeing that it helps businesses to take control of and manage their environments better. Data is sent to your preferred cloud platforms, such as AWS or Azure, you are then able to set up alert configurations directly from here and then respond to alerts in the manner in which you prefer. IoT is the solution for the smart business of the future. Netshield’s WIFI IOT Multi Sensor and IO modules is the smart solution for IoT. Information Technology - News, News, Special Development - News Tags: IoT, Sensore, WiFI, Wireless. Bookmark the permalink.